Undefeated Notre Dame has already handed out a pair of losses to teams ranked inside the top 20 in the country. The No. 6 ranked Fighting Irish used a rock-solid defensive effort to hand previous No. 7 ranked Stanford its first loss of the season. Notre Dame’s defense limited the Cardinal to 229 total yards on 51 snaps including nine quarterback sacks and five tackles for a loss. Notre Dame’s offense was extremely balanced with QB Ian Book and RB Dexter Williams each having monster games. Book threw for 278 yards and four touchdowns and Williams, in his first start of the season, ripped off 161 yards on 21 carries with a touchdown. On opening weekend of the season Notre Dame knocked off Michigan and now has a win over Stanford. Those are the only losses for those two teams and each squad remains ranked inside the Top 20 nationally. Learn more about Notre Dame Chapter Leader Christopher Schilling in the latest installment of our Beyond The Trophy series. Clemson: It took overcoming some serious adversity at the quarterback position and two fourth-quarter touchdowns for the Tigers to stay undefeated against previously unbeaten Syracuse at home. Travis Etienne rushed for more than 200 yards and scored the winning touchdown inside the final minute to nudge the Tigers past the Orange. Syracuse, which led by two scores with 10 minutes to play, was in search of its second win in a row over Clemson. The Tigers converted a clutch fourth-and-6 during the winning drive to set the table for the final-minute victory. Stony Brook: In a match-up of Top 20 ranked FCS squads, the Seawolves found themselves down 21-0 to Villanova late in the second quarter before rattling off 29 unanswered points to hold on for a narrow 2-point home victory. Part of the credit goes to the SBU defense that was shredded early but rallied to post 10 tackles for a loss and four sacks. DE John Haggart tied for the team lead in tackles with eight and had three of the 10 TFL’s and two of the sacks. Saint Francis: The Red Flash scored on all six of its first-half possessions and finished with more than 400 yards of offense in a blowout victory over NCAA Division II West Virginia Wesleyan. Nick Rinella returned a punt 79 yards for a touchdown to break the 40-year-old school record of 70 yards set in 1978. Florida State: Even the Seminoles were surprised the way they pulled out a road victory at Louisville. It took some shaky play calling late in the game by the Cardinals for FSU to have a shot. But they capitalized on it when QB Deondre Francois hit Nyqwan Murray with a 58-yard strike with 1:13 to play that capped a 14-point fourth-quarter rally. Davidson: The Wildcats won for the first time in 17 tries at Valparaiso with a thrilling come-from-behind victory. Davidson trailed by a point (35-34) late in the fourth quarter before embarking on a 9-play, 75-yard march capped by a James Story 1-yard TD run inside the final minute to win it. .
NC State: For the third straight year the Wolfpack won their ACC opener and moved to 4-0 overall with the home win against Virginia. NC State is now ranked in the Top 25 for the first time this season. Against the Cavaliers, QB Ryan Finley threw for three scores, freshman RB Ricky Person went over 100 yards and DT Larrell Murchison had three sacks. Colgate: The Raiders are 4-0 and scoring on the Colgate defense is getting more difficult with each passing week. The Raiders posted their second shutout in a row against William and Mary and has gone 12 quarters without allowing a touchdown. Holy Cross was the last team to score a touchdown on Colgate and that TD came midway through the fourth quarter in the season opener – a streak of nearly 187 minutes without surrendering a touchdown. 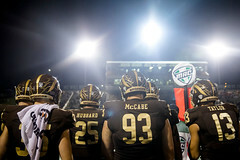 Western Michigan: For the fourth straight year the Broncos opened MAC play with a come-from-behind victory on the road at Miami. QB Jon Wassink, who threw for 439 yards and five touchdowns, scored on a 2-yard plunge with 2:53 to play to win it. Freshman WR Jayden Reed tied a school record with four TD catches on seven grabs and career-high 137 yards. WMU has won three straight after starting 0-2 with losses to Syracuse and Michigan, a couple of 4-1 squads. Princeton: The Tigers rushed for 360 yards and scored 25 points in a 6:32 stretch midway through the game to stay unbeaten and claim their Ivy League opener. The No. 23 ranked Tigers used 311 total yards from QB John Lovett to subdue Columbia, whose rush defense had been strong the first two weeks, by five touchdowns on National TV. Colgate had a Bicentennial Blast on Saturday as Raiders kicked off their second century celebration by drubbing Lafayette at home to improve to 3-0 on the young season. All the rage in Hamilton over the weekend to kick off Colgate’s Bicentennial festivities was the throwback uniforms the Raiders wore to honor the Colgate’s famous 1932 “Undefeated, Untied, Unscored Upon … and Uninvited” team. The idea behind these one-of-a-kind uniforms was two years in the making and the idea was hatched by Broc Hazlet, Colgate’s Director of Equipment Services. In his words “I wanted to do something different.” Raiders coach Dan Hunt was on board right away and Hazlet knew he had a true design partner in the head coach as they set out to on this project. Abu Daramy-Swaray intercepted a pass in the end zone and returned a punt 77 yards to highlight a game that was never in doubt after the Raiders went up 15-0 in the first quarter and never looked back. Learn more about Davidson Chapter Leader George Hatalowich in the latest installment of our Beyond The Trophy series. Princeton: For the first time since 1886 the Tigers opened a season scoring 50-plus points in back-to-back games after rolling Monmouth in the home opener for Princeton. WR Jared Horsted was one of three Tigers to have a big day, but the senior also became the all-time leading touchdown receptions leader in school history to earn the Uplifting Athletes Rare Performance of the Week award. Syracuse: This week is all about Clemson, but in order to get the sizzle behind the match-up with the ACC champs the Orange had to get to 4-0 for the first time since 1991 by taking out UConn. Syracuse has scored 50 or more points in three of its four games heading into Death Valley. Stony Brook: The Seawolves picked up their third consecutive victory and went to 1-0 in conference play on the strength of running backs Jordan Gowins and Donald Liotine, dubbed as the Long Island Express, after each rushed for more than 100 yards for the third consecutive Saturday. Penn State: Facing serious adversity for the second time this season, this time on the road on a Friday night at Illinois, Penn State closed strong again with 42 unanswered points after falling behind 27-24 midway through the third quarter to dispatch of the Fighting Illini. NC State: Don’t look now but the Wolfpack are 3-0 and continue to float under the ACC radar after dispatching of Marshall on the road. Jarius Morehead came up with the first interception of the season for NC State and returned it 57 yards for a score the sealed victory No. 3. Maryland: Freshman RB Anthony McFarland ran for 100-plus yards with two scores and LB Tre Watson returned a touchdown for a score as the Terrapins bounced previously undefeated Minnesota to improve to 3-1 overall heading into Big Ten play. 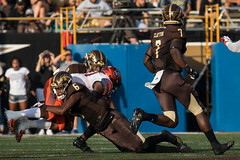 Western Michigan: Sparked by a defense that produced three turnovers, three sacks and a whopping 10 tackles for a loss the Broncos subdued Georgia State for their second win in a row and first victory on the road this season. Junior LB Drake Spears was the tip of the WMU defensive spear with nine tackles, two sacks, three tackles for a loss and a forced fumble. Penn: The Quakers offense continues to sizzle as Penn won it’s sixth game in a row dating back to last season and is 2-0 this year thanks to more than 500 yards of total offense against Lehigh. Most impressive was Penn called 39 running plays from scrimmage and all 39 went for positive yards. The Quakers did not have a negative rushing play on its way to piling up 30 points. Baylor: In a battle of 2-1 teams with Kansas, the Bears defense showed up big-time by registering four sacks, the most in 16 games for Baylor, and had five more tackles for a loss to limit the Jayhawks to a single touchdown. The Bears are 3-1 and face Top-10 ranked Oklahoma on the road this week. Florida State: The Seminoles started fast and played aggressive defense all game to subdue Northern Illinois at home. QB Deondre Francois threw for 352 yards and two touchdowns and the FSU defense limited the Huskies to 221 total yards. Notre Dame: Fighting Irish QB Ian Book made his first start of the season a memorable one, guiding the Notre Dame offense to 56 points and more than 550 yards. Book accounted for five touchdowns (three passing, two rushing) and completed 25 of his 34 passes for 325 yards to keep Notre Dame undefeated.